Following the program, you will learn more about getting involved with the Marketplace Risk Management Conference (May 21-22, 2019) and the Technology Marketplace Collaborative, which is the national association devoted to representing, educating and advocating for the benefit of the web and mobile marketplace technology industry and those who exchange goods, services and property through web and mobile marketplaces. Founders of the Technology Marketplace Collaborative will be on hand to answer questions, including from Angie’s List / HomeAdvisor, Care.com, Dolly, Ingenio, Lyft, Shiftgig, Sittercity, TaskRabbit, UrbanSitter, and/or uShip. This promises to be a fun, informative event and a great way to learn about and get involved with the Marketplace Risk Management Conference and Technology Marketplace Collaborative! The Marketplace Risk Management Conference is presented by Checkr. 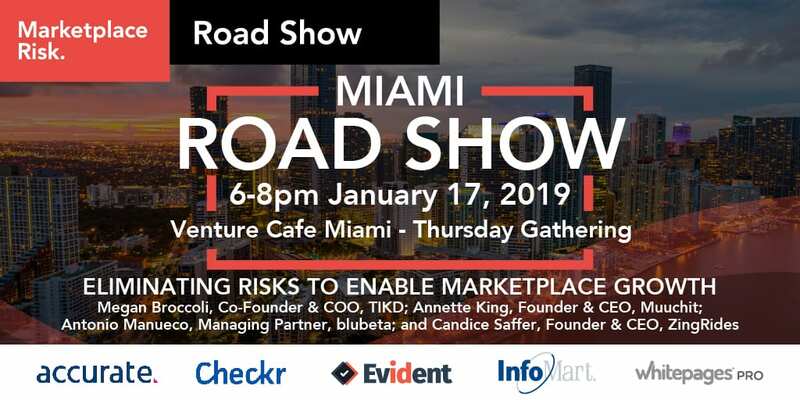 Thank you to our Marketplace Risk Road Show host Industrious, and to all of our Marketplace Risk Road Show sponsors, including Accurate, Checkr, Evident, InfoMart, Mitek and Whitepages Pro, for their support.